Brooklyn, NY Toll Brothers City Living, the urban development division of Toll Brothers, Inc., and Starwood Capital Group unveiled their model home at Pierhouse. Located in the 85-acre Brooklyn Bridge Park and offering views of the Manhattan skyline, Pierhouse consists of 106 townhome-style residences spread across two separate waterfront buildings. The environment, conceived by landscape architect Michael Van Valkenburgh Associates, includes private rooftops and landscaped terraces designed to complement the surrounding park. The condominium is expected to achieve LEED Silver certification. The model home is a three-bedroom, two-and-a-half bath duplex located on the fifth floor of the North building. Totaling 2,664 interior s/f with an 88 s/f outdoor terrace, the residence features spectacular views of the New York skyline, East River, Statue of Liberty, and Brooklyn Bridge Park. Both the interior and exterior were sustainably designed by Marvel Architects. 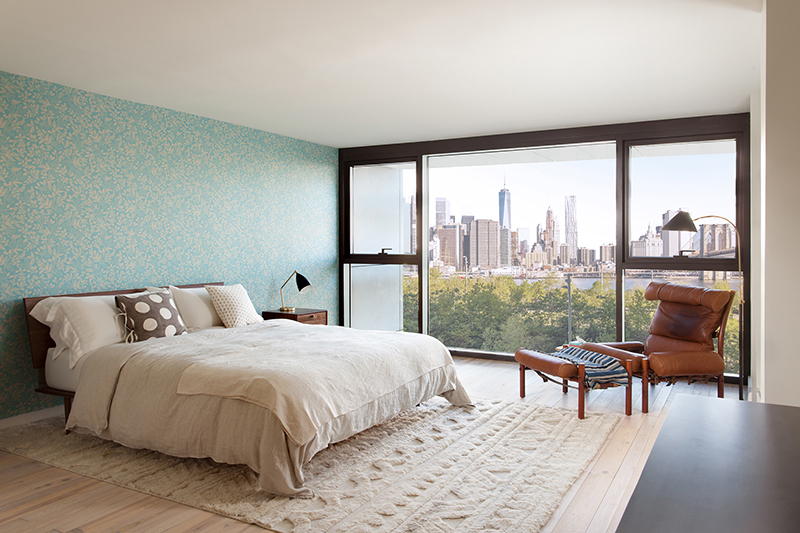 “Now that we have a model apartment available on-site, prospective buyers can truly experience first-hand everything that makes Pierhouse special from the incredible setting and views to the eco-design and finishes,” said David Von Spreckelsen, the New York Division President of Toll Brothers City Living. “Each home offers 600-year-old, reclaimed heartwood pine floors, composting units, rainwater irrigation systems, as well as high-efficiency interior and exterior LED lighting and an energy-efficient solar shade systems throughout.” The majority of the one-to-five-bedroom homes are duplexes, many with double-height living rooms and private outdoor space. 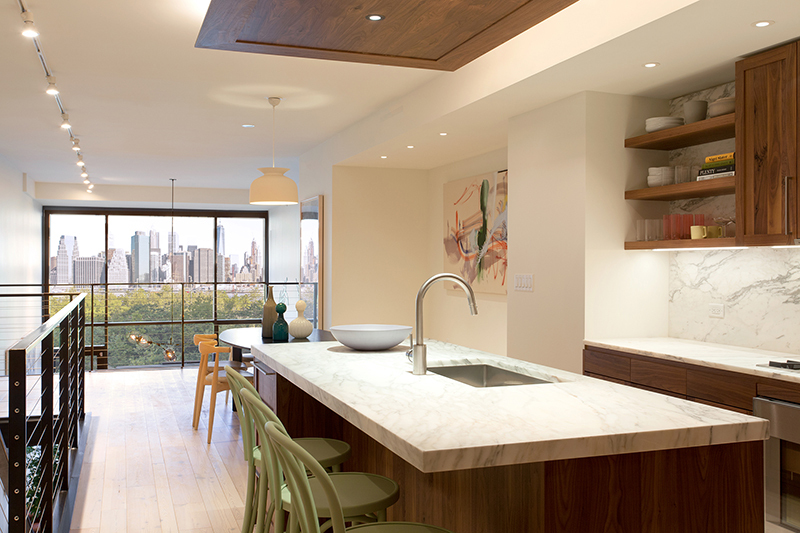 Kitchens feature Gaggenau appliances, honed Calacatta Tucci marble countertops, solid American walnut cabinets, and locally sourced 18-bottle wine storage. 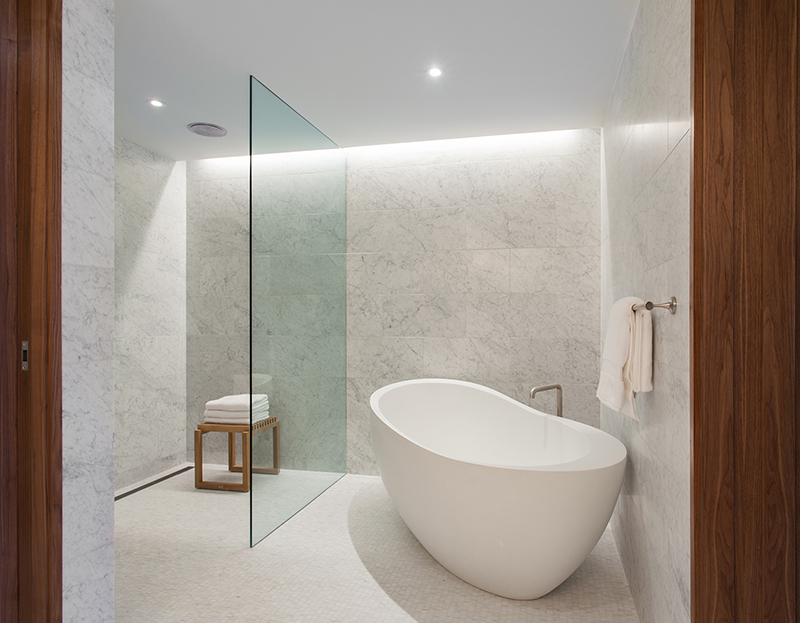 Bathrooms feature Waterworks fixtures, Ruscello Fosso Picollo marble floors, and walnut and brushed nickel vanities. The selection of granite for the building’s exterior was inspired by the Brooklyn Bridge, which is visible just to the north of Pierhouse. Residents have access to countless amenities, including two 24-hour attended lobbies, multiple fitness centers, a meditation studio, a teen and an adult lounge, children’s playroom, pet wash, refrigerated storage, and on-site, valet parking. Cyclists will be welcomed with bicycle storage and access to Brooklyn Bridge Park in their front yard. Additionally, residents can utilize the amenities of the adjoining eco-luxe 1 Hotel Brooklyn Bridge, which includes a farm-to-table restaurant that will prepare fresh, local ingredients, a world-class spa, rooftop pool and bar, an artisanal café and juice bar, private dining rooms, a wedding terrace and over 20,000 s/f of event space. On the waterfront, at the intersection of Brooklyn Heights and DUMBO, Pierhouse is located in Brooklyn Bridge Park, offering more than a mile of outdoor space and ample room for boating, athletics, dog-walking, and more. Brooklyn Heights offers a perfect blend of residential charm and all the conveniences of city-living with the iconic Brooklyn Heights Promenade providing picturesque views during a stroll through the neighborhood. DUMBO is home to one of the premier art districts in New York, a yearly farmers’ market, and the critically acclaimed DUMBO Arts Festival. The ferry’s DUMBO stop is just a few steps away from Pierhouse, with several subway lines nearby.